To date President Trump is true to his campaign promises. Here is a list of President Trump’s Accomplishments with comparisons to Congress and Obama. President Trump started off as aggressive as any President ever in working for the American people as he promised. In President Trump’s first six months since the election and since his inauguration the US Stock Markets are at record highs and millions of Americans are benefitting in their retirement savings accounts. * The DOW daily closing stock market average has risen 21% since the election on November 8th. (On November 9th the DOW closed at 18,332 – on August 7th the DOW closed at 22,118). * The DOW took just 66 days to climb from 19,000 to above 21,000, the fastest 2,000 point run ever. The DOW closed above 19,000 for the first time on November 22nd and closed above 21,000 on March 1st. * The DOW closed above 20,000 on January 25th and the March 1st rally matched the fastest-ever 1,000 point increase in the DOW at 24 days. 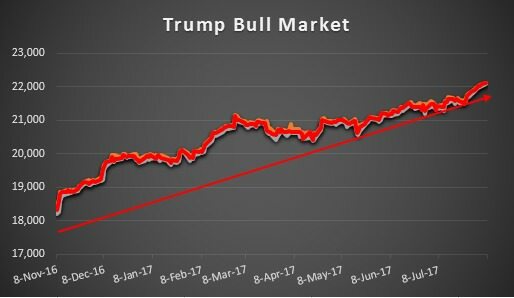 * On February 28th President Trump matched President Reagan’s 1987 record for most continuous closing high trading days when the DOW reached a new high for its 12th day in a row! * On Monday August 7th President Trump oversaw the 2nd stock market rally of his Presidency of 9 or more days in a row of all time closing highs. No President has ever overseen 2 such rallies! * The S&P 500 and the NASDAQ have both set new all-time highs during this period. * The US Stock Market gained $4 trillion in wealth since Trump was elected! * The S&P 500 also broke $20 Trillion for the first time in its history. As of today, President Trump decreased the US Debt since his inauguration by (-$102) Billion. President Obama increased the US debt in his first 200 days by more than $1 Trillion. More than 1.1 million fewer Americans on food stamps under President Trump. According to the Bureau of Labor Statistics President Trump added a projected 1,290,000 jobs in his first 200 days (January through July 2017.) 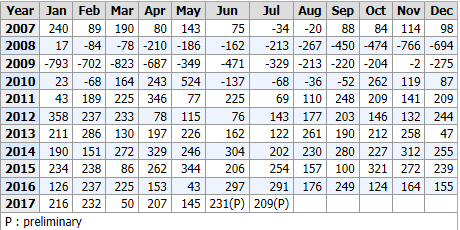 President Obama on the other hand lost more than (4,154,000) million jobs in his first 200 days. Also according to the Bureau of Labor Statistics President Trump decreased the unemployment rate since his inauguration from 4.8% to 4.3% (January through July 2017). The unemployment rate in January 2017 was 4.8% and by July it was down to 4.3% . President Obama on the other hand moved in the opposite direction. 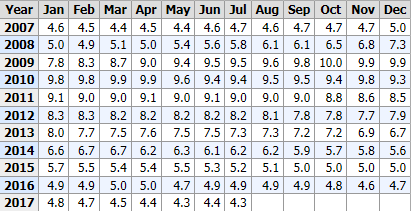 In his first 200 days as President the US unemployment rate increased nearly each month from 7.8% in January 2009 to 9.5% by July of 2009. 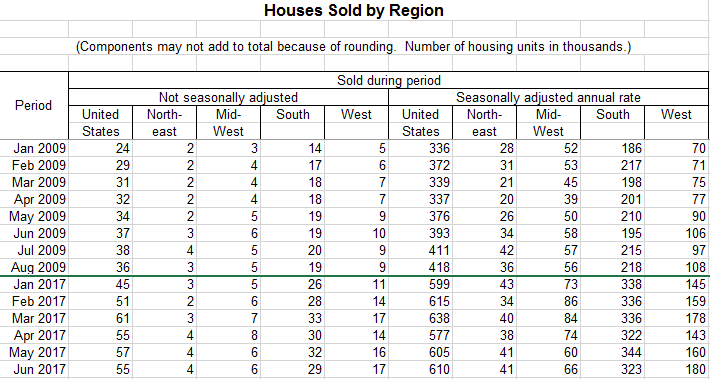 Housing sales are red-hot in the US right now. In 2011, houses for sale were on the market an average 84 days. This year, it’s just 45 days. One of the first things that President Trump did in office was to reduce the number or burdensome regulations put in place during the Obama era. In January President Trump signed his 2 for 1 executive order mandating that for every new regulation, two regulations needed to be revoked. Even far left Politico notes that significant new federal regulations since Trump’s inauguration have slowed to an almost total halt. Regulations cost Americans and American companies money to implement and maintain. Reducing or halting regulations allows companies to spend their money on more prudent money making areas. The US Manufacturing Index soared to a 33 year high in President Trump’s first six months which was the best number since 1983 under President Reagan. Illegal immigration is down 67% since last year under President Trump. * President Trump is donating his paycheck. He gets nothing from us for all of this work. * He had a major victory on sugar exports from Mexico. Made Mexico drop the exports % and the amount of refined sugar. 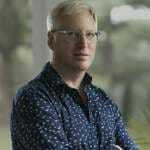 Will help our sugar industry and the US sugar mills that produce refined sugar from raw sugar. 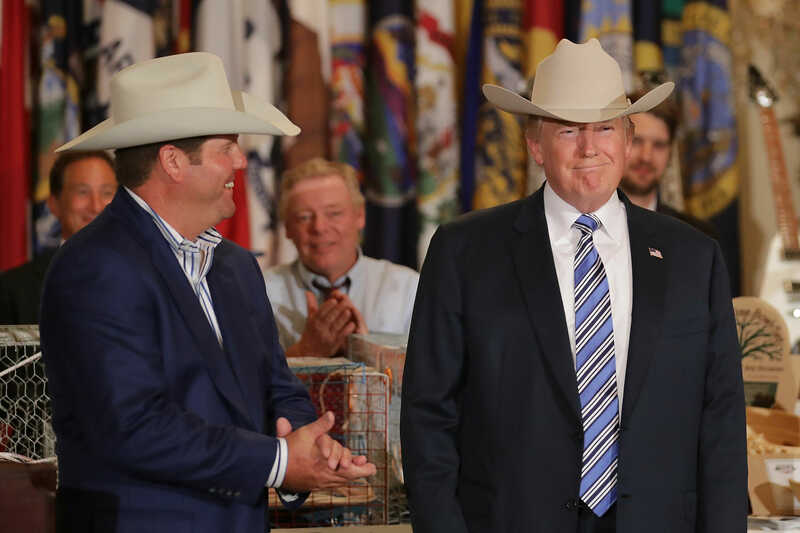 * He opened up selling beef to China and LNG gas as well as giving a way to get 1 billion Chinese credit scores so the USA can offer them credit. Trade deal was done in record time. * Secretary Ross slapped more than $2 billion in fines on China and Canada for illegal trade practices. * He launched the United States-Canada Council for Advancement of Women Entrepreneurs and Business Leaders with Canadian PM Justin Trudeau. * He cut $1.6 billion costs from Air Force one and F-35 airplanes. * He put a regulatory freeze on all federal governmental agencies. * TRAVEL BAN upheld by SCOTUS by 9-0 ruling. Extreme vetting will now become law of the land. * The one material action taken by Congress was to confirm Justice Gorsuch to SCOTUS! * The Senate voted for VA accountability act – A major victory for Trump agenda signed into law on 06/23/17. The President also pointed out numerous times that the MSM (Main Stream Media) reports only on a made up Russia conspiracy story and ignores these accomplishments. These actions are making the majority of Americans aware of the tremendous bias and falsehoods emanating from the media in the US and abroad. This too is another major Trump accomplishment. President Trump is doing all he can for the American people and as a result the economic results are incredible. In nearly every category the economy is improving under President Trump especially when compared to the same time period for President Obama. In spite of Congress’s somewhat pathetic results to date President Trump is providing Americans positive and historic results and hope for the future.